We're still celebrating Ribbon this week, won't you join us? Stephanie says, "I started with this amazing vintage holiday card from my stash that I trimmed down slightly ... I thought a simple wrap of ribbon was the perfect accent to bring out the vibrant pink in the top bell ... sometimes for me, simple is best." 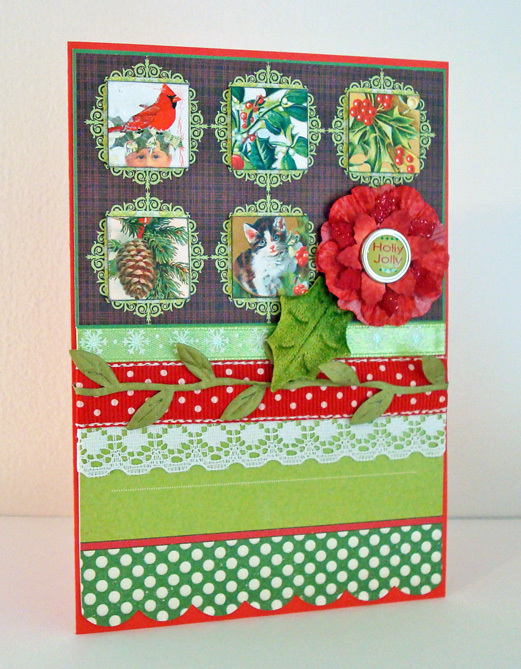 Lauren says, "As in all things, I concur with Stephanie: sometimes-- for all of us-- simple really *IS* best; thus this week I decided to do a Christmassy CASE of a birthday card I made last year for a ribbon challenge at Shopping Our Stash. This simple design let me use FOUR of my favorite holiday ribbons... two of which were scraps! Hard to beat that for convenience, right?! A few embellishments later, and I was one card closer to my third stress-free December!" Remember ... you have until 6pm EST on June 5th to join our Ribbon Rendezvous. 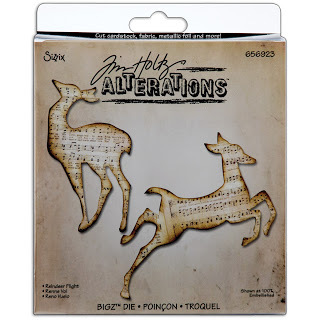 The next Jingle Belles prompt is to create a holiday card using ... Ribbon. If you're like us, you've got more spools of ribbon than you'll likely use in a lifetime of creating, so now is the time to let it shine ... tie it in a bow, tie it in knots, create a background ... just get creative with ribbon. 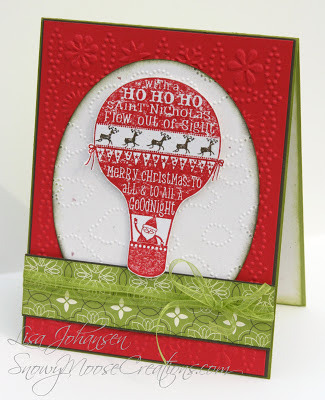 Lauren says, "This week I fell in love with the Unscripted Sketch, and immediately knew I wanted to rotate it ninety degrees in order to use these great ARTchix holiday inchies at the top. I found a piece of very old Prima paper with little 1.25" frames to hold them... how perfect is that?! After I loaded up the lower section with lace, polka dotted grossgrain, thin satin snowflake ribbon, and my all-time favorite May Arts leafy ribbon, I called it a day. Ribbon mission accomplished!" 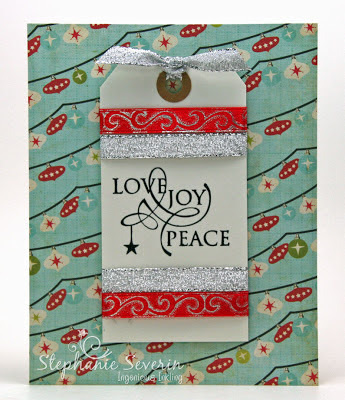 Stephanie says, "For this week's card I started by stamping Love Joy Peace on a art craft tag. Next I wrapped two kinds of holiday ribbon (attached with double-stick tape on the back) to create my borders. I tied another piece of silver ribbon through the top of the tag, and then attached my creation with foam tape (a great way to hide any lumpy pieces on the back. 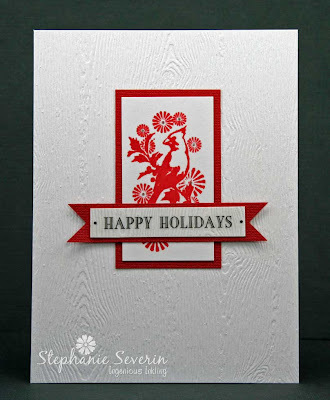 The vintage background paper is from Echo Park Seasons Greetings." So pull out those spools of ribbon and let your creativity soar ... and remember to link your holiday card between now & June 5th at 6pm (EST) ... and use keyword JB:13:11 for galleries & our Flickr Group. 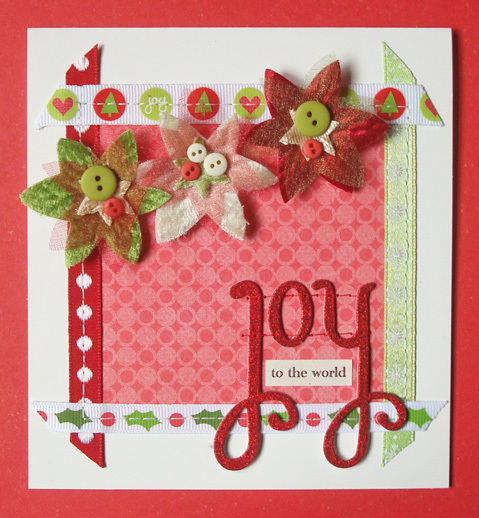 We love how you embraced the Merry & Bright this week ... so many happy holiday cards. Here are a few of our favorites. created a gorgeous vibrant background for that popping yellow holiday ornament ... her card just screams festive! 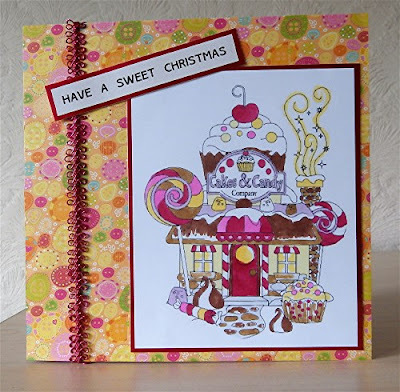 created this super-sweet candy castle filled with vibrant hues ... it looks good enough to eat. rocked the neon with this caroling chicken trio ... and those doodled frames are perfection. 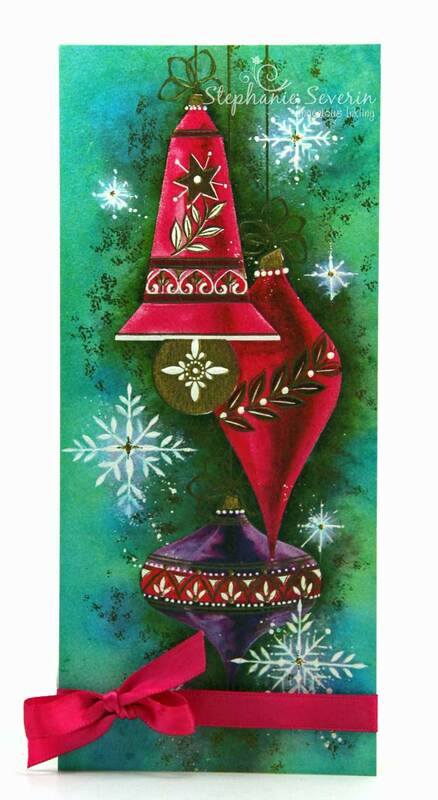 Make sure you click through the gallery & celebrate all of the joyous holiday cards ... and come back at midnight for another fun holiday card prompt. Stephanie says, "When I saw this dazzling Gelato Background by the talented Roxie, I knew it would be the perfect technique for my card this week. I used Red, Orange and Yellow Gelatos on Watercolor Paper and blended with a baby wipe. Once the Gelatos were dry, I stamped Fresh Squeezed Holiday Subway Art in India Ink and clear embossed. All that was left to do was attach my panel to a white card base using foam tape." Lauren says, "Well I don't suppose I need to tell you where I got the idea for this one, do I, lol?! 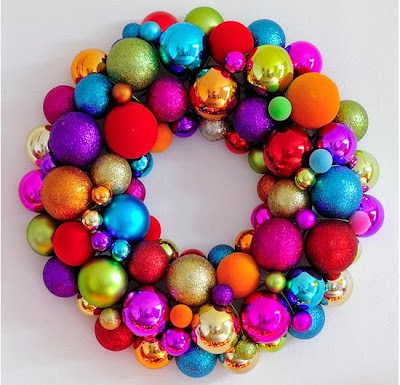 Yepper, that wreath in the inspiration photo was just TOO COOL... or should I say TOO HOT... to resist! After making my own background paper, punching loads of circles from the brightest scraps I could find, and grabbing this week's Fetch-a-Sketch I was all set!" We've got our sunglasses on ... so show us your best & your brightest holiday creations. 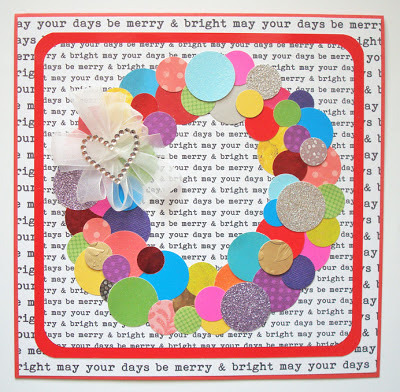 This week we're celebrating all things Merry & Bright ... we're asking you to create a card using BRIGHT colors. Here's a photo for some Merry & Bright inspiration. So pull out your Neons & Vibrant Hues and show us how BRIGHT you can be. Stephanie says, "I broke out the Winter Trees and Neon inks and created a a vibrant holiday landscape ... love how the colors pop." 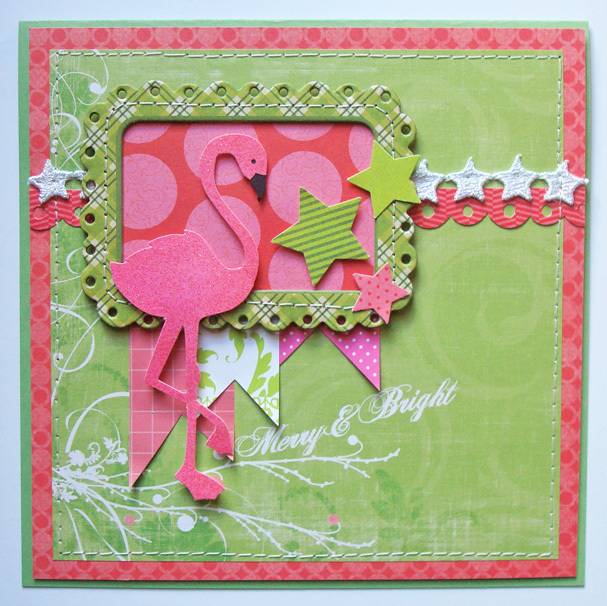 Lauren says, "For some reason, as soon as I heard the word "bright" I started thinking, "FLAMINGO!!!" I'm not really sure how that happened, but I decided to just go with it, lol. 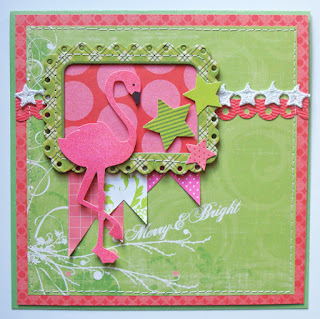 :) I used last week's Mojo Monday sketch for my layout and went crazy with as many bright pinks and greens as my scrapbox would yield... which turned out to be quite a few!" 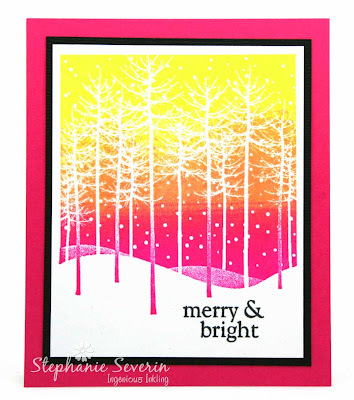 So break out the BRIGHTS and show us some eye-popping colors in your holiday creations. Link up your cards between now and May 22nd at 6pm (EST) ... keyword for galleries & our flickr group is JB:13:10. Sent Santa up in the most charming hot air balloon we've ever seen (check out those reindeer!) raising our spirits right along with him! 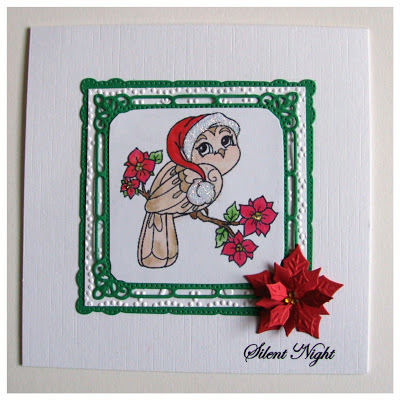 Cleverly combined Christmas colors and a sweet little bird with flowers and snowflakes, for a card that would get a smile from us any day of the year! 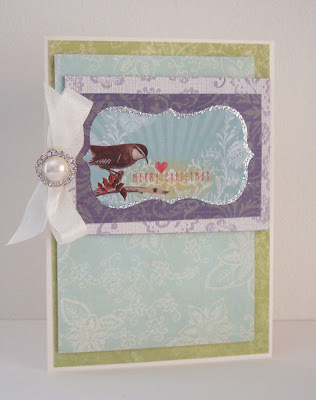 Perfectly stamped and colored a "clean and simple" card that's as elegant as it is adorable. 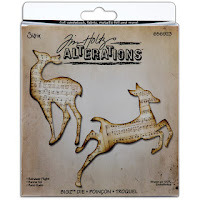 Of course it also always makes us happy to award a little random blog candy to one of our fellow card-makers, so let's see who'll be having that super-fun "Reindeer Flight" die cut set then, eh? 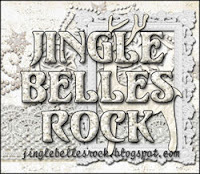 Brenda, please email us at jinglebellesrock @ hotmail [dot] com with your snail mail address and we will get that out to you ASAP! We're still celebrating holiday things that fly: angels, doves, cardinals, sparrows, Rudolph pulling Santa's sleigh... you name it! Won't you scroll down and check out the gallery with us? 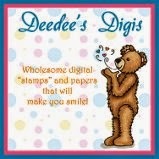 Then c'mon back and link up your own card! 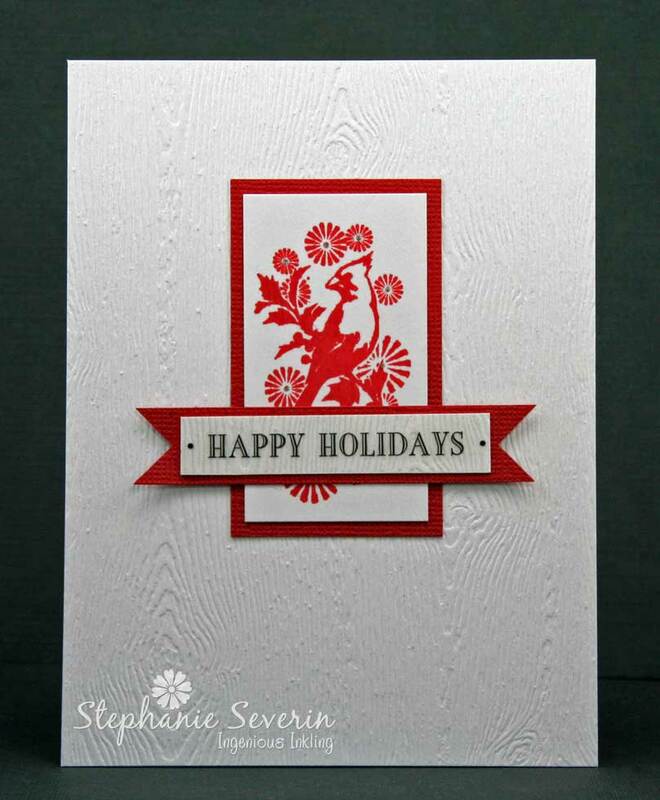 Stephanie says, "I love Cardinals ... especially Christmas Cardinals. I kept this one clean & simple with a wood grain paper base & SRM Sticker sentiment. Layout is from Less Is More." Lauren says, "Ok, I realize I've used my Papaya Art holiday glitter stickers several times this year already... but in my defense, since so many feature lovely little birds, i just found them totally irresistable for this prompt! This time I've paired a lovely label shape with the current Retro Sketch (#61), and used Color Throwdown Palette #240 as additional inspiration!" Remember ... you have until Wednesday, May 8th at 6pm EST to link-up for a chance to win a fun prize ... and be one card closer to taking back your December.